These Diamond Dangle Earrings are understated elegance at it’s best. Nestled inside the dangles are 3, 1mm diamonds. The can made wider to accommodate larger stones as well. The length is adjustable as well. 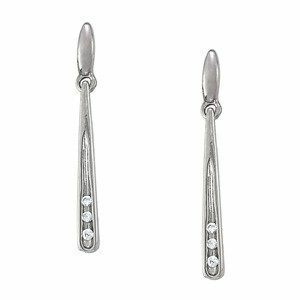 The listed price is for Sterling Silver Diamond Dangle Earrings with CZ. Click HERE to learn more about custom jewelry, to see our portfolio, or to contact us about Diamond Dangle Earrings. It can cost less than you think to have your very own custom diamond earrings made just for you. Why hassle with the retail stores for boring and overpriced gemstone earrings?